Many people think ice creams or sorbet, perhaps an icy cold beer when it’s hot out. Yes, all those things sound pretty good, but for me there can only be one choice. The one thing that outmatched everything else for me in its sheer simplicity and refreshing quality. It may not be fancy, it might not impress the ‘how-do-you-do’s’ but it’s quick and easy to make and tastes great. If you’re anything like me, you can’t walk past a great deal on fruit while you’re browsing the market. This normally ends up with some super ripe pineapples in the fridge. Pineapple is my favorite fruit and I always end up buying enough for any event. For this particular one I took my two insanely ripe pineapples that were just begging to be juiced and a cup of red globe grapes. You don’t need the grapes, but I feel like something sweet today. 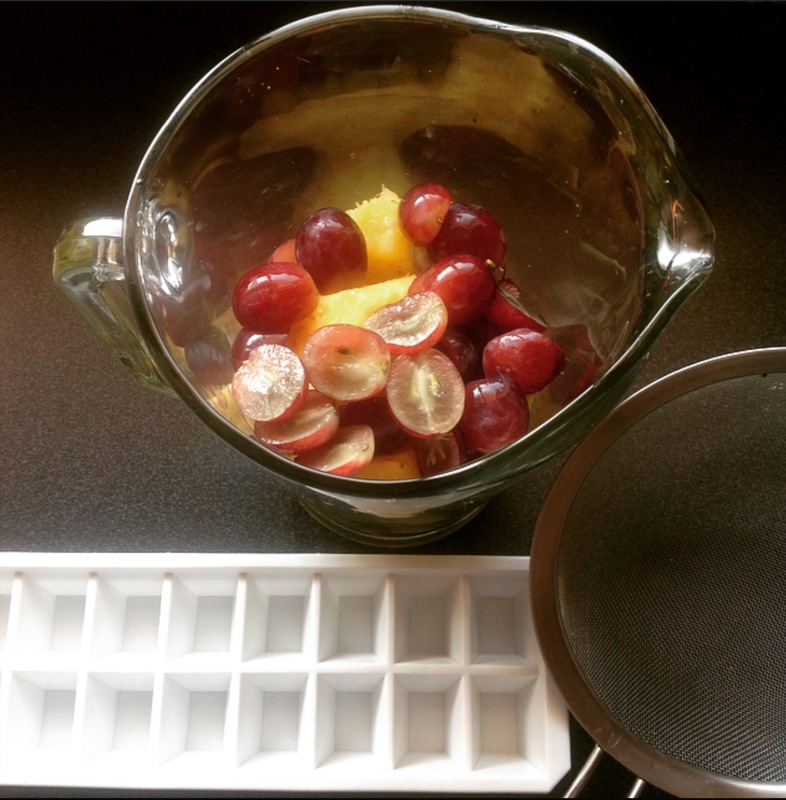 It’s as easy as peeling the pineapple, chopping it up, and adding it to a blender with the grapes (or use a stick blender) and letting it run. I promise that I won’t often use the word ‘sieve’, but if you like a smooth consistency rub the puree through a sieve. Don’t bin the chunky leftover fruit. It will taste great in your morning muesli or add it to muffins. When I make a plain pineapple ice I freeze the leftover pineapple chunks and use it for cooking. Keep an eye out for upcoming post on all the amazing things you can do with pineapple. All that’s left to do now is pour the mix into ice trays and wait for it to set. I recommend making several trays, or keeping a supply of ready-made blocks in zip lock bags. Have them in an ice cold glass of water, sparkling mineral water or get creative and make a slow mixing cocktail and add them to your favorite tipple. If you like your ice to be an even smoother and harder set, take the extra time and let the juice run through a muslin cloth. If you don’t have a blender and you’re still salivating to make these, you can use your normal fruit juice. Just pour it into an ice tray and let it set. This is a fantastic way to make great tasting ice lollies. I will defintely be trying this coming Summer. Thanks. 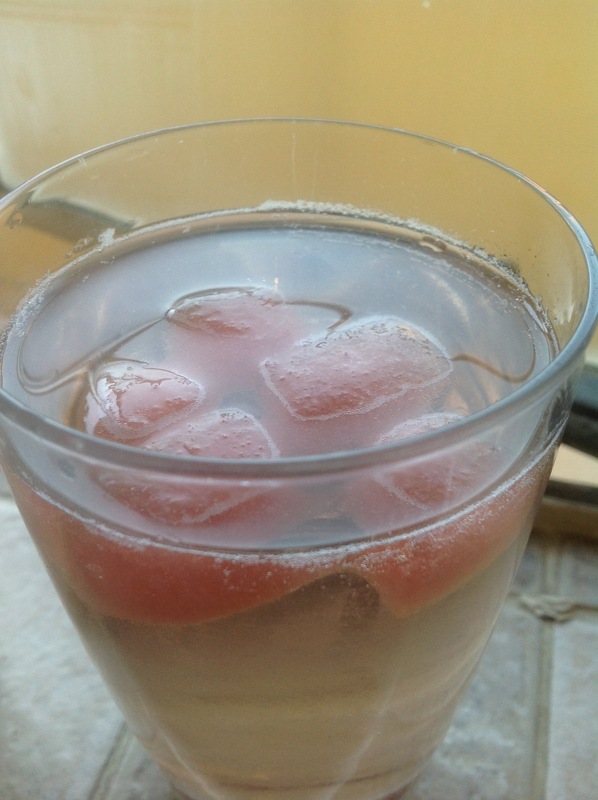 It is so refreshing and I love how the flavor builds up as the cubes melt.